For the last five years I’ve been a frequent diner here at Haywards. This to me is an easy decision as for one it’s only half an hours drive away. The other reasons are is that the food is simply amazing which is matched by the fabulous service you receive from an excellent young team. It’s not hard to see why this restaurant once again won Best Restaurant in Essex and now also has the well deserved honour of being a 2 AA Rosettes restaurant to which I’m sure in the future will increase. So as I said the food created by Chef Jahdre Hayward is fantastic and full of stunning flavours which without any doubt has been improving year by year. So what to expect in 2019 well if our first visit of this year is anything to go by then I would recommend booking a table now as you’ll be in for a treat. We arrived on Saturday for lunch and received our usual nice welcome before being shown to what I can now say is our regular table. While enjoying our pre lunch drinks owner Amanda said that if it was ok with us Chef has created for us a Special Tasting Menu which would include all the new dishes. 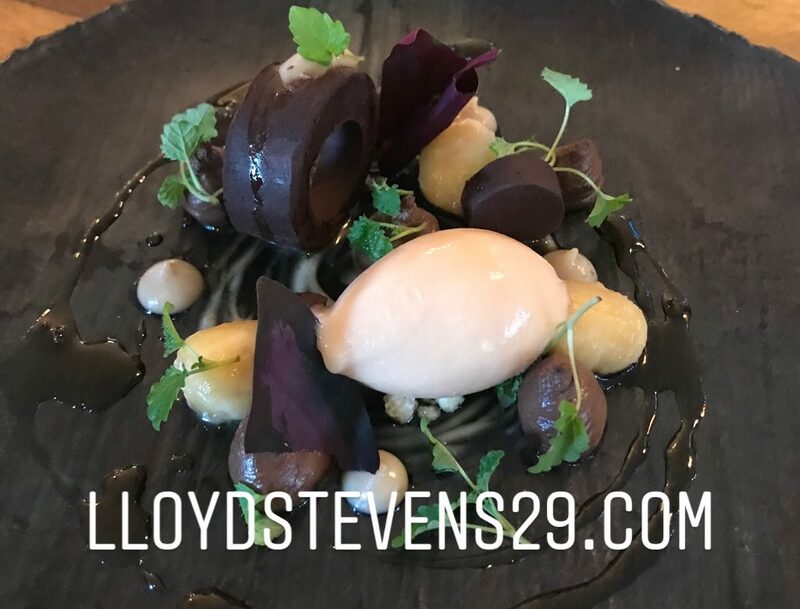 A lunch time Tasting Menu is something that they’re looking to introduce so please feel free to ask about it’s availability. Well honestly how could we refuse so gladly accepted and couldn’t wait to see he’d produced. We started first with some fabulous Granary Sourdough Bread before enjoying a Carrot & Ginger Veloute along with Paprika Crackers & Arancini Balls. Now it was time for our first course and wow it was outstanding a Foie Gras & Green Tea Ballotine with Salted Grapes & Pickled Apple a truly amazing way to begin. This was followed by a fantastic vegetarian dish a Roasted Cauliflower with Ricotta Dumplings , Capers , Pine Nuts & Raisins just heaven. Now on to our next course and yes it was another dish full of flavour as we were treated to a Ham Hock Boudin , Jerusalem Artichoke Purée & Thyme Foam simply delicious. This heavenly dish led us on to our main course which consisted of a Pan Roasted breast of Pheasant , Confit Leg & Caramelised Celeriac Purée with the added delight of Potato Dauphinois which is always amazing here. We now needed a rest before moving on to desserts to which we were told there would be two. This was music to my ears as yes I love desserts. The first dessert was a devine Coconut Brûlée with Mango Sorbet & White Chocolate Aero . This was followed by a Pumpkin Tart with Nutmeg Ice Cream & Poached Clementines & Purée. We wondered if the Tart would be a bit savoury but it was nice & light and worked well with the nutmeg ice cream it was just delicious. We finished with a coffee and petit fours to bring to an end another fabulous lunch at Haywards and if this is what’s to come in 2019 then all diners are in for something special. I would highly recommend a visit so you can see for yourself why this restaurant gets the accolades it deserves. In Jahdre they have one of the best chefs around & under the guidance of Amanda & Anne the front of house team are so friendly and professional. So don’t delay and book a table today you will not be disappointed. I’ll probably be back in a couple of weeks for another fantastic visit. Tasting menus are such a good idea I enjoyed my very first one on holiday last year and I know I have been missing out. It’s clear to see why you enjoy Haywards the food looks and sounds amazing!